Fully-independent 1000-rpm PTO is available as a factory- or field-installed option. 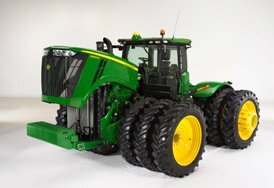 Available on all 9R and 9RT Series Ag Tractors regardless of transmission. See specs for model rated PTO horsepower. 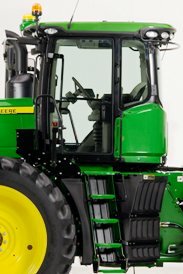 The 9R Series Tractor utilizes an electrohydraulic (EH) PTO-engagement switch to activate the optional 1000-rpm PTO. Service points are quick and simple to check. Single-point latch mechanism and self-contained leash ensure easy hood opening and closure. 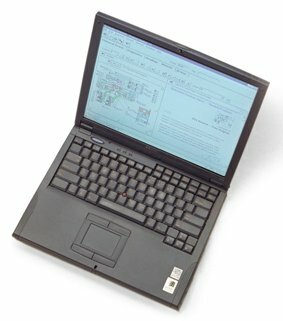 The 9R 1325 L (350 U.S. gal.) 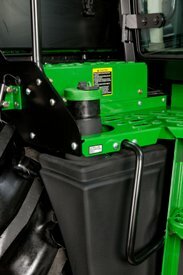 fuel tank is easily filled from the right or left side of the tractor. and the 9RT 1287 L (340 U.S. gal.) is easily filled from the left side of the tractor. 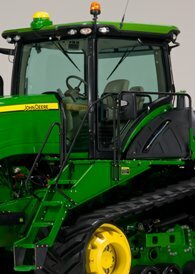 John Deere supports the usage of bio-diesel. Bio-diesel should meet ASTM D6751 (US) or EN 14214 (European) fuel quality standards. The one-piece tilt hood design provides side shields and guards for additional engine compartment protection. 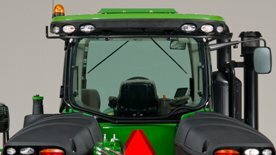 A sight glass for the transmission, hydraulic, and axle oil level is located at the right side of the tractor indicating proper oil levels and an oil fill neck is located on the back left side of the transmission for the 9R Series Tractor. 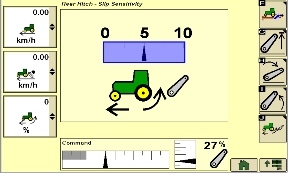 The oil fill is located on the top of the common reservoir on the right side of the 9RT Series Tractor and a fill tube is located at the rear of the tractor. 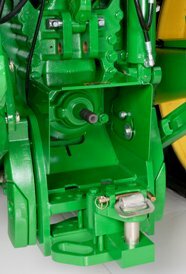 This common oil location improves on the two separate locations of the 9030 Series Tractors. 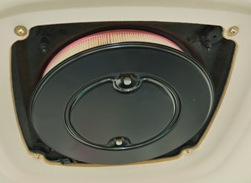 The primary engine air filter is accessible from ground level for replacement annually or as operating conditions require. The filter is aspirated and extends filter life in dusty conditions by aspirating over 95 percent of incoming dust. Aspirator suction is created by utilizing the air flow from the cooling fan. 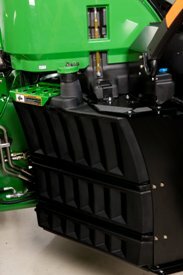 The engine features a 500-hour change interval when using approved John Deere PLUS-50 II oil and John Deere oil filter. 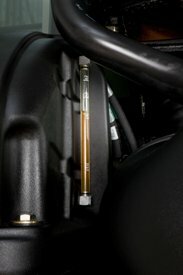 Previous initial oil and filter change at 100 hours in no longer required due to the factory oil fill of Break-In Plus. If using anything other than John Deere PLUS-50 II a 250-hour change interval is required. CJ-4 must still be used. 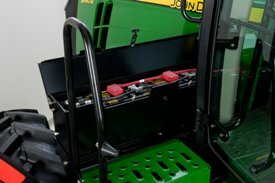 The 9R Battery box is located at the top of the platform and on the 9RT the top step of the platform conceals the tractor’s three 12-V batteries 2775 (3-925CCA). Although the batteries are maintenance-free, conditions such as long periods of operation at high ambient temperatures and excessive engine cranking may require adding water. A battery boost terminal is located on the left-hand side of the engine for convenient and proper boost-assisted starting. The solid-state load center’s primary function is to control the majority of high-current loads, such as fender floodlights and the horn. This electronic circuitry will monitor loads and voltages to provide fast reaction time and the ability to alert the operator if a circuit overloads or if voltage is out of specification, for example open circuit (undercurrent) or short circuit (over-current). 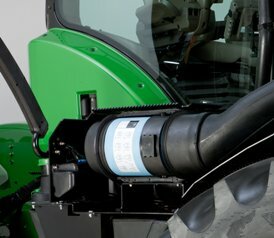 The windshield washer bottle (optional) is located next to the right side fuel fill of the tractor. A toolbox is conveniently located next to the left side of the batteries on the 9RT. 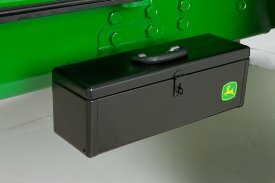 A convenient toolbox is optional on the left-hand side of the front frame for tool storage and comes standard on all 9R and 9RT Series Tractors. The load/depth feature is a useful tool designed to increase performance in tillage applications. Load/depth adjustments allow the operator to make adjustments to hitch draft responsiveness. Draft control helps maintain the operating depth in varying conditions such as rolling terrain and varying soil densities. An additional feature with load/depth control is the hitch slip option. Hitch slip uses wheel slip data to supplement the draft control system. 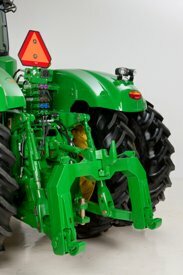 If the wheels slip, the 3-point hitch lifts to allow the tractor wheels to maintain traction with the ground. 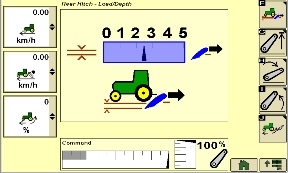 Once the slip condition is no longer present, the hitch lowers to the required depth as determined by the hitch command and load depth settings. Both of these hitch command options are easily programmable in the CommandCenter display by pressing the load/depth shortcut key, followed by simply using the thumbwheel and confirm key to dial in the desired settings. 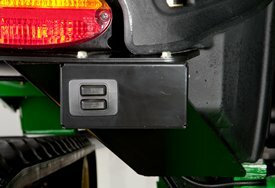 For added operator convenience, a 3-point hitch remote control switch is located on top of the left rear fender for 9R and 9RT Series Tractors. 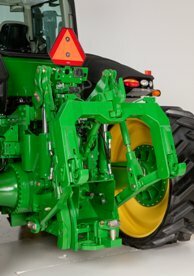 The external remote switches enable the operator to raise and lower the 3-point hitch from behind the tractor while hooking to implements. 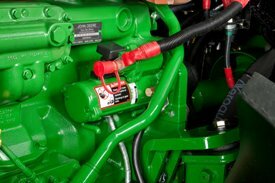 Optional high-flow hydraulics are available on 9R and 9RT Series Tractors equipped with a PowerShift Transmission (PST) by ordering code 3270. The high-flow hydraulic system provides an additional 30 gpm (114 L/min) of flow for a total of 78 gpm (295 L/min). This system is ideal for hydraulic fan motor demands. 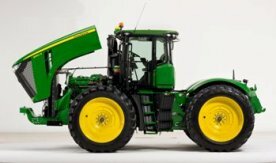 The 9R and 9RT Series Ag High-Flow Tractor has two parallel hydraulic systems. The benefit of this system is that functions can be split between the two systems. Functions that require high flow and low pressure can be combined on one system (for example, air seeder fans, and planter motors). Functions that require high pressure and low flow can be connected to the remaining system (for example, implement lift, fold, and constant down-pressure systems). 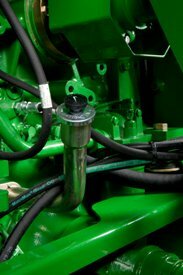 Following these guidelines allows the hydraulic system to run cooler as it prevents both hydraulic pumps from running at high pressure. In general, pumps forced to run at both high pressure and high flow generate much more heat than a pump running at a lower flow or lower pressure. Pump 1 - Provides hydraulic flow of up to 48 gpm (182 L/min) to SCVs 1, 2, and 3. These SCVs are useful for operating lift/lower and other cylinder type hydraulic needs. Pump 2 - Attaches in front of pump 1 and provides hydraulic flow of up to 30 gpm (114 L/min) to SCVs 4 and 5. These SCVs are useful for operating hydraulic motors to drive air/fan or vacuum systems on seeding/planting equipment. This system is recommended for agricultural implements with continuous flow requirements. When maximum hydraulic pump capacity is reached, multiple functions will continue to operate at the same proportional flow rate. 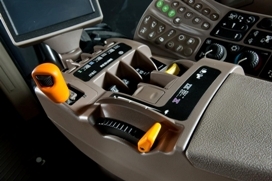 Efficiency Manager (EM) allows for IVT-like operation on the 18-speed PowerShift transmission. With EM engaged, the operator no longer has to manage the engine revolutions per minutes (rpm) and gear selection for the most efficient level of operation possible. Efficiency Manager does that automatically by shifting up and throttling back depending on the load on the tractor. 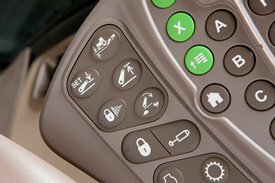 With the tractor sitting still, in neutral, or once the tractor is in motion, the operator simply pushes either the F1 or F2 switch on the CommandARM™ to activate the feature. Once EM is activated, the operator can set and adjust the desired ground speed by using the thumbwheel on the shift lever. An icon and the desired ground speed will appear on the corner post display once EM is activated. NOTE: Efficiency Manager is not recommended during for use during high draft load applications. We do not recommend the use of Efficiency Manager during the cut cycle in scraper applications. Efficiency Manager is recommended during the transport cycle of scraper applications. CommandCenter™ display for monitoring and adjusting tractor settings as well as AutoTrac™ and John Deere Section Control capabilities when ordered with touch screen. 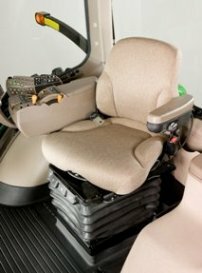 The ComfortCommand seat is built using cut-and-sew cushion construction, adjustable backrest angle, and lumbar support controls for maximum operator comfort. The cut-and-sew design allows material to move independently of the foam, providing additional comfort. The seat is covered in a soft but durable fabric that breathes, and the cushions are removable for easy cleaning. An optional leather seat covering is also available. 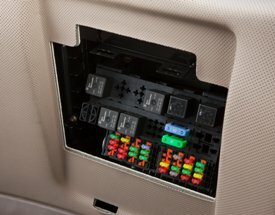 Operator presence switch - warns if operator is out of seat while operating key functions. 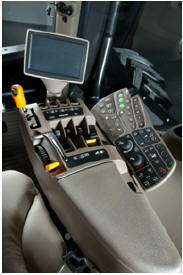 The 9R and 9RT Series Tractors utilize a CommandARM with an integrated CommandCenter display. Many of the features and controls that were on the right-hand console have been integrated into the CommandARM. The controls and CommandCenter follow the operator as the seat swivels for added comfort. In addition, A through J soft keys, a thumbwheel, and other CommandCenter navigation keys are integrated into the CommandARM. 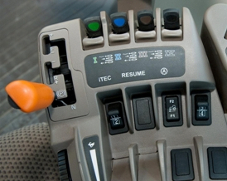 AutoTrac™ assisted steering system resume switch (if equipped). The CommandARM can also be repositioned for additional comfort and to accommodate different operators. The cab’s four cornerpost support structure provides a wide opening for front window glass, creating excellent forward visibility from the seat. Front window glass is as wide at the bottom as it is at the top. The front sunshade is integrated into the headliner and recessed. There are no view-obstructing components attached to the chassis. 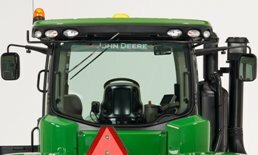 The large rear window provides excellent visibility to the drawbar, 3-point hitch area, and rear-mounted implements. The cab supporting structure provides wide openings for rear window glass, creating excellent visibility paths from the seat. Selective control valves (SCVs) with hose couplers, are unitized for compact size and are stacked horizontally. This provides a clear visibility path to the drawbar. 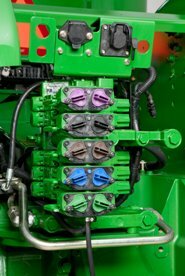 The optional GreenStar™ JDLink System from Ag Management Solutions (AMS), including Select and Ultimate versions, allows operators to optimize the true performance capabilities of their 7R, 8R/8RT, and 9R/9RT Series Tractors. Optimization occurs by continuously collecting and transmitting machine data for machine management purposes via mobile phone technology. 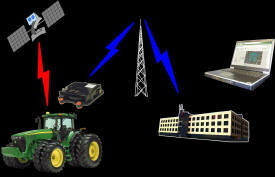 In collecting operational information, the system enables the preventive maintenance and remote diagnostics of tractors, as well as the tracking of machines working on multiple work sites. Information collected by JDLink includes location, machine hours, oil temperature, idle time, maintenance intervals, and a variety of other machine settings. The data collected by JDLink is communicated to a central John Deere server and made available to registered users via a password-secured JDLink Website or through e-mail, fax, or SMS messaging. Machine owners can then access valuable equipment information quickly and efficiently to optimize machine operations before problems are realized by the current operator. There is a current JDLink Ultimate promotion featuring a one-year free subscription with the purchase of a 7R, 8R/8RT, or 9R/9RT Series Tractor. 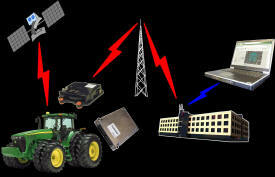 For further information on the JDLink system and the appropriate tractor bundles required for a fully-functional JDLink system, please refer to the AMS product information. Service ADVISOR diagnostics greatly assist in reducing service costs and downtime. 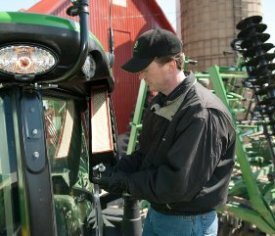 It allows the John Deere service technician to readily extract vital information about tractor malfunctions through the Service ADVISOR data port. Diagnostic codes and CAN bus statistics stored by the tractor and visible in the CommandCenter™ are used by service technicians to isolate, identify, and resolve problems. All 7, 8, and 9 Family Tractors come JDLink capable with all of the components necessary to use JDLink and Service ADVISOR Remote included in the base price. With the JDLink Ultimate promotion, receive a one-year free subscription in base price. Below are all of the ordering options. 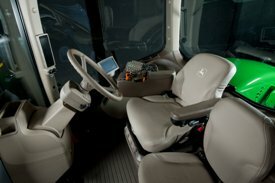 NOTE: Includes JDLink hardware: integrated cab wiring harness, antenna, modular telematics gateway (MTG) with Service ADVISOR Remote capability, and JDLink Select activation. Requires purchase of JDLink Select subscription sold separately. NOTE: Includes JDLink hardware: integrated cab wiring harness, antenna, modular telematics gateway (MTG) with Service ADVISOR Remote capability, and JDLink Ultimate activation. Requires purchase of JDLink Ultimate subscription sold separately. In addition to JDLink Select features this includes: machine utilization information, machine reports, and machine diagnostics. NOTE: Includes JDLink hardware: integrated cab wiring harness, antenna, modular telematics gateway (MTG) with Service ADVISOR Remote capability, JDLink Ultimate activation, and one-year subscription to JDLink Ulitimate service. In addition to JDLink Select features this includes: machine utilization information, machine reports, machine diagnostics. 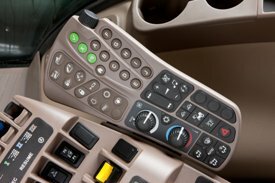 NOTE: Includes JDLink hardware: integrated cab wiring harness, antenna, modular telematics gateway (MTG) with Service ADVISOR Remote capability, and JDLink Ultimate activation, and three-year subscription to JDLink Ultimate service. In addition to JDLink Select features: machine utilization information, machine reports, machine diagnostics. 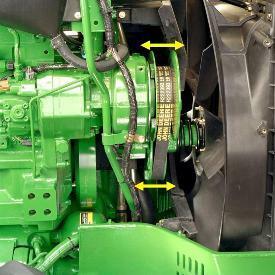 John Deere has engineered the PowerTech PSX 13.5L (824 cu. in.) 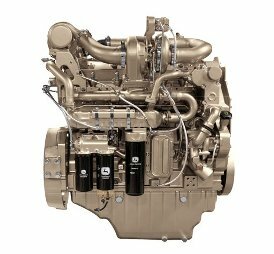 engine to meet the high expectations for fuel economy and performance that operators expect. The PowerTech PSX 13.5L (824 cu. in.) utilize two turbochargers – a variable geometry turbocharger and a fixed geometry turbocharger, providing the torque rise and engine responsiveness to meet varying load conditions. Fresh air is first drawn into the low-pressure fixed geometry turbocharger and compressed to a higher pressure. The compressed air is then drawn into the high-pressure Variable Geometry Turbocharger where the air is further compressed. The compressed air is then routed to the charge air cooler, and then to the intake manifold. By splitting the work between two turbochargers, both can operate at peak efficiency and at a slower rotating speed. The VGT is electronically controlled and hydraulically actuates the turbo vanes as required to maintain peak engine performance. The turbocharger’s vanes are in the exhaust flow. The opening or closing of the vanes changes the outlet volume and airflow speed against the turbocharger impeller. When exhaust flow is low, the vanes are partially closed. This partial closure increases the pressure against the turbine blades to make the turbine spin faster and generate more boost pressure. 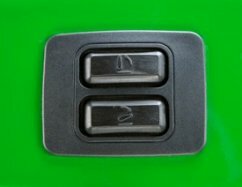 The ability to keep the airflow flowing at optimum levels provides more consistent engine boost pressure and the ability to respond to load quickly across the entire engine rpm range. This system is without turbo lag as can be found on some engines. Boost pressure in the intake manifold is controlled at its optimum point for added fuel economy and performance regardless of rpm or load. Air-to-air aftercooling lowers the intake manifold air temperature and provides more efficient cooling while reducing cylinder firing pressure and temperatures for greater engine reliability. Since low temperature air is denser, a higher volume of air flows into cylinders so the engine is capable of meeting the increasing horsepower demands. This engine control unit uses signal inputs from sensors and pre-programmed performance modeling to control critical engine functions such as fuel quantity, injection timing, air-to-fuel ratio, multiple fuel injections, amount of cooled Exhaust Gas Recirculation (EGR), and a host of other control parameters to deliver peak fuel economy and engine performance. This management system is connected to the transmission allowing the engine and transmission to respond simultaneously. Cold weather and high altitude compensation are also precisely controlled for quality starts regardless of weather and proper power levels at high elevations. The injection system also contributes to the engine running at a decreased noise level by a process called pilot injection. The precise fuel injection capabilities allow a small amount of fuel to be injected early in the combustion process. This helps lessen the combustion knock that is commonly heard on many diesel engines. While the combustion noise reduction is most obvious at lower engine speed, pilot injection continues to function at any engine speed. 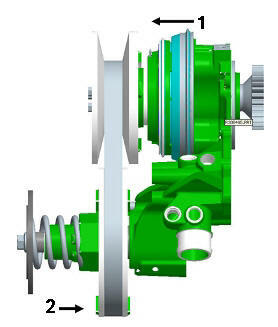 The variable fan speed sheave is electronically controlled only operating at the necessary speed to cool the engine and other auxiliary components. The Vari-Cool system is an integrated part of the hood design. Intake and outflow of air from the coolers is diverted to key openings in the hood structure. 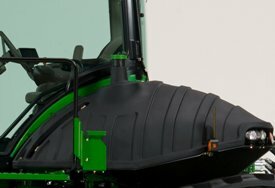 The design allows for airflow dispersion that lessens dust and crop kick-up by discharging the airflow away from the cab. This electrohydraulic system uses variable speed drives. Actual fan speed is determined by the ratio differences of the top fan drive sheave to the bottom sheave. 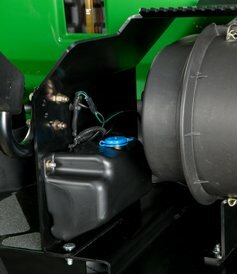 The electronic control unit monitors various sensor inputs from the tractor and automatically changes the sheave ratio to change the fan speed. 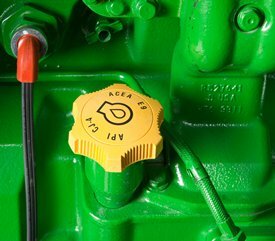 Hydraulic oil pressure is directed to the pistons that push the top inner sheave out (A), to close the gap and create a larger working diameter. The bottom sheave (B) responds by compressing the coil spring, widening the gap between the two sheave halves, and creating a smaller working diameter to increase the fan speed. To slow the fan, the valve opens, allowing oil to leave the piston, widening the upper sheave halves. This feature monitors engine coolant temperature, engine oil pressure, and transmission oil pressures while the transmission is in the park position, and the operator is out of the seat. If any of the systems reach undesirable levels, the tractor will shut down, to help prevent further tractor damage.